Stirling Maynard are proud of the high standard of quality achieved in the provision of its services since its foundation in 1927. The Company has made quality one of its foremost objectives and is committed to maintaining these standards in all the services provided. Internal systems to control and monitor quality have been developed and applied over many years and these form the foundation of our Quality System which fully complies with the requirements of ISO 9001. Our Quality Management System defines procedures and records each step to ensure that these procedures are followed. The system is monitored both internally and by independent audit, so that continuing effectiveness, compliance and continual improvement is maintained. Construction Quality Assurance undertook the initial Third Party Assessment in March 1993 to consider formal Certification, which was granted in April 1993. 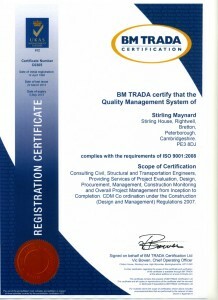 Exova BM Trada now independently audit the system. “Consulting Civil and Structural Engineering, Providing Services of Project Evaluation, Design, Procurement, Management from Inception to Completion and ‘Principal Designer’ under the Construction (Design and Management) Regulations 2015 (CDM 2015)”. The System is accredited with the United Kingdom Accreditation Service (UKAS).